If you’re looking for a wide range of information on one particular surname, a one-name study site may be worth your while. These sites usually focus on one surname regardless of the geographic location where the surname appears. In other words, they welcome information about people with the surname worldwide. These sites are quite helpful because they contain all sorts of information about the surname, even if they don’t have specific information about your branch of a family with that surname. Frequently they have information on the variations in spelling, origins, history, DNA, and heraldry of the surname. One-name studies have some of the same resources you find in personal genealogical sites, including online genealogy databases and narratives. Although one-name study sites welcome all surname information regardless of geographic location, the information presented at one-name study sites is often organized around geographic lines. For example, a one-name study site may categorize all the information about people with the surname by continent or country — such as Helms in the United States, England, Canada, Europe, and Africa. Or, the site may be even more specific and categorize information by state, province, county, or parish. So, you’re better off if you have a general idea of where your family originated or migrated from. But if you don’t know, browsing through the site may lead to some useful information. The Bowes Surname website is a one-name study site with several resources for the Bowe, Bows, Bow, Boe, and De Bowes surnames. From the home page, you can choose to view news on recent additions to the site, articles on current discoveries, results of the surname DNA project, research in different countries, and information on how to join a mailing list of the surnames. The maintainers of one-name study sites welcome any information you have on the surname. These sites are often a good place to join research groups that can be instrumental in assisting your personal genealogical effort. To find one-name study sites pertaining to the surnames you’re researching, you have to go elsewhere. Where, you ask? 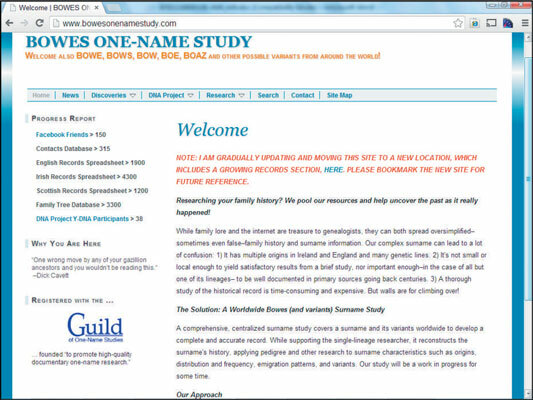 One site that can help you is the Guild of One-Name Studies. Open your web browser and go to Guild of One-Name Studies. The home page appears with a search field just below the title of the site. Type the surname you’re researching in the field titled Is Your Surname Registered? If a registered one-name study is available, you see a box entitled See a Profile of This One-Name Study. Click the box to find more information about the one-name study. The profile contains information such as a website address and e-mail address of the maintainer of the one-name study.